I’m confident this is the most complete timeline in all of the internet. 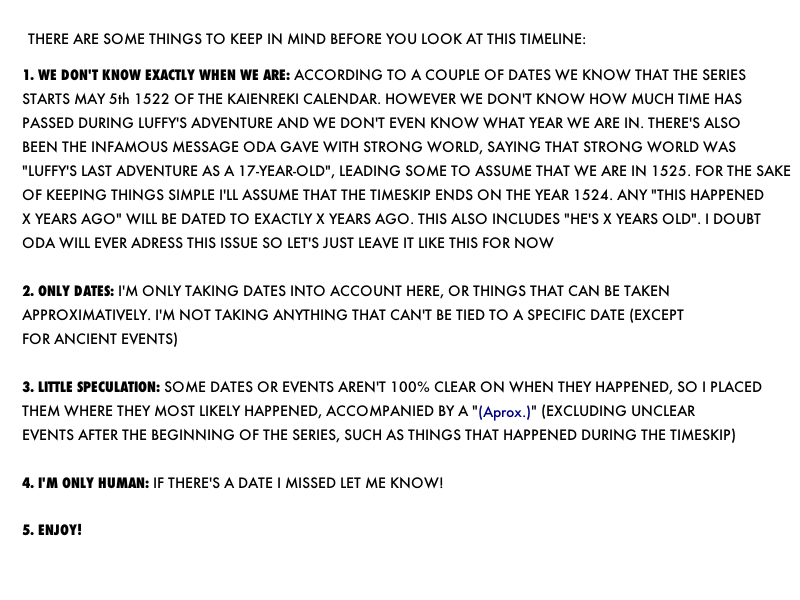 I’ve checked every date, so all of this should be canon, or at least the closest to canon. Feel free to use this for any theories or reference! This is a non-profit analysis of chapters of the ©One Piece comic book series, written by ©Eiichiro Oda and published by ©Shueisha and ©Toei. This is intended for educational and critical purposes and is in no way trying to replace the original content. All images are used only to explain the subject at hand and are not supposed to replace the original content, but only aid as a visual guide. This is fair use under the law and I fully support and encourage the purchase of the official product to every single one of my viewers. i think you forgot this important event, “ace has been meet shanks before he met shirohige”. it certainly an awesome event, right?